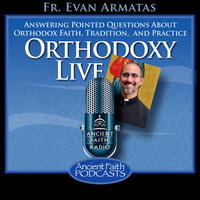 On this special edition of Orthodoxy Live, Fr. Evan chats with OCF students from College Conference East and West. On this special edition of Orthodoxy Live, we take you to the 2012 College Conference of the Orthodox Christian Fellowship where Fr. Evan takes questions from the students in attendance. Calls from across the country on subjects ranging from the Orthodox perspective on Halloween to a 10 year old's question about our age in heaven. Calls were abundant on this episode on topics like Hades, the atonement, the immaculate conception and more.